RSW- Artwork page, "October Gold"
CalTech Collection 1980 - ? Purchased by Mrs. Henry P. Everett, the prominent collector of Cleveland, Ohio, and Pasadena, California. Checkout the Scrapbook to see other Famous Owners! Checkout the Painting Story October Gold. October Gold was purchased by famed art collector, Josephine Everett. Mrs. Everett was the wife of Henry A. Everett, founder of the Cleveland Electric Railway Company. She had purchased a total of 10 paintings by Woodward. Upon her death, she willed his work to the Pasadena Museum of Fine Arts and the San Diego Museum of Fine Arts respectively. For more regarding Mrs. Everett see also our Scrapbook Page. 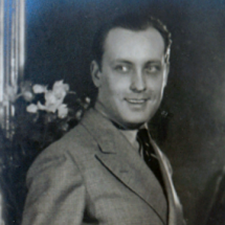 Famous stage actor Joseph Holland, who in the role of Caesar, was reportedly stabbed on stage by Orson Welles (playing Brutus), opening night of the 1937 Mercury Theater's production of William Shakespeare's Julius Ceasar. It is unknown how Mr. Holland came into possession of October Gold, once in the collection of CalTech University but October Gold was not the only Woodward he owned. He also owned, Winter Design so it is very likely he knew of Woodward prior to purchasing October Gold. 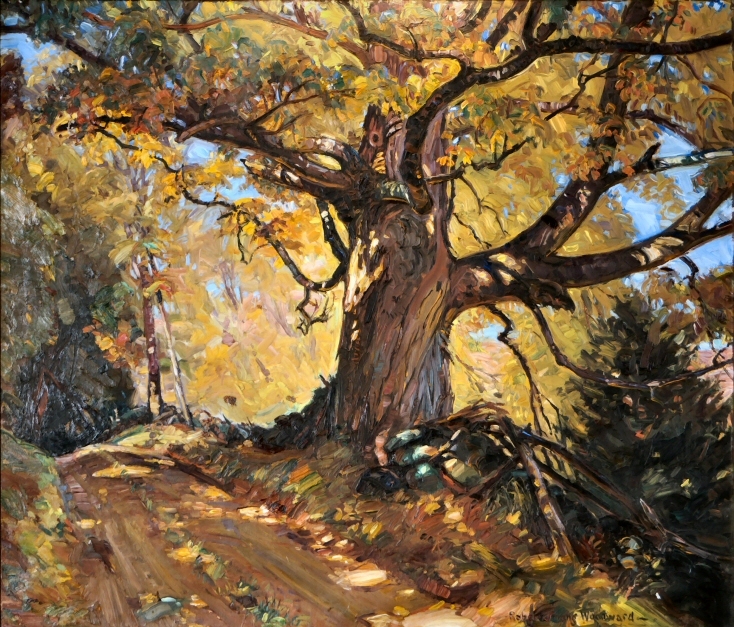 "Painted in fall of 1929. 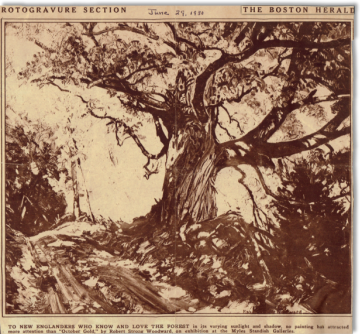 A painting made of a giant old maple tree (shaped like an oak) in brilliant foliage on back road from Ashfield to Conway near Pine Hill where Archibald MacLeish lives. Sold to Mrs. Henry P. Everett, the prominent collector of Cleveland, Ohio, and Pasadena, California. At her death, in the late 30's it was willed to the permanent collection of the San Diego Art Museum in San Diego, California." There is so much to say about October Gold. First, this particular painting was not discovered until its current owners contacted the website (2015). 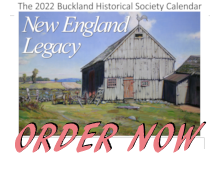 It was then, with the confirmation of the name on the back of the stretcher and it matching the size noted in RSW's records we realized that the painting bought at auction in Mystic, CT and believed to be October Gold, is, in fact, is an unknown named painting of the same subject. There are differences between the two paintings when examined more closely. The most striking is they were painted in different styles. 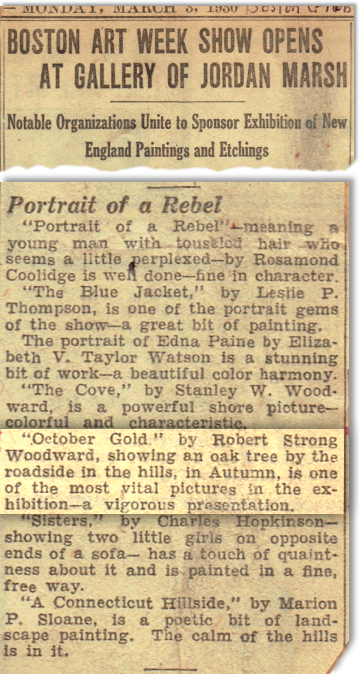 The painting October Gold, purchased in Mystic and now known as An October Gold is distinctly a style Woodward used from the years 1923 to just around 1928-9. This piece on this page is clearly in the brush style Woodward finally settled on for the remainder of his career. For more we suggest you see our Scrapbook page devoted to October Gold *Note* still under construction. One last note to make regarding the two October Golds - the unnamed October Gold, was exhibited at Woodward's 125th Birthday Celebration Exhibition under the name An October Gold, because at that time we believed it to be October Gold. Mrs. Everett purchased October Gold some time around 1930 and died in 1938. According to a letter from her attorneys Mrs. Everett willed her Woodward collection as follows: the Pasadena Museum of Fine Art gets first choice, followed by the San Diego Museum of Fine Art. Artwork not chosen will be sold at auction. However, the attorneys for Mrs. Everett makes no mention of October Gold in their letter to Woodward. Woodward, however, does make note in his diary that October Gold was willed to the San Diego Museum of Fine Art and so we have to trust his word. We want to note that it is unclear to us how Woodward knew this. The remaining knowledge regarding the provenance of October Gold comes from the current owners provding us access to the painting itself. As seen in the pictures, the stretcher is marked with numerous clues to its time at CalTech. There is a stamp (upper left) of Mrs. Everetts name. We do not know who made the mark. Upper right: Here we see two labels noting CalTech. It appears that receipt of the painting by CalTech was on November 11, 1980. It also appears it was given an id number or some sort of way to identify it for their records. 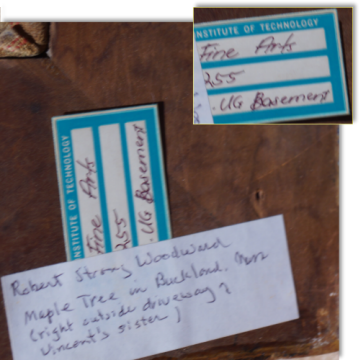 Lower right: Another label regarding CalTech, partially covered by a recent label with a hand-written description of the paintings origins. The CalTech label appears to note where the painting was stored. What we don't know is HOW it ended up in the CalTech collection. If it came from an exchange between CalTech and the San Diego Museum of Fine Arts or was there another owner in between.